Apple today announced the launch of iTunes U, a dedicated area within the iTunes Store, featuring free content such as course lectures, language lessons, lab demonstrations, sports highlights and campus tours provided by top US colleges and universities including Stanford University, UC Berkeley, Duke University and MIT. 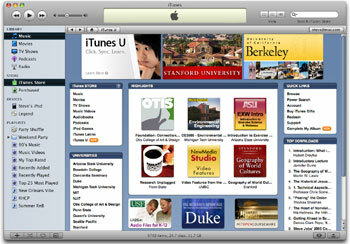 With the introduction of iTunes U, Apple is largely burying the idea that these audio and video shows are podcasts. There is no mention about podcasting in Apple’s press release, and there’s nothing in iTunes to reveal to typical users that the content might be podcasts. Slightly confusingly, the free content is available through the iTunes U section of the Apple Store, but shows up in iTunes’ podcast section once added. iTunes U provides a dedicated page for each university, with custom branding and links to significant university resources. Created in collaboration with colleges and universities, iTunes U makes it easier than ever to extend learning, explore interests, learn more about a school and stay connected with an alma mater. Content from iTunes can be loaded onto an iPod with just one click and experienced on-the-go, anytime, making learning from a lecture just as simple as enjoying music.